“The passage of time brings with it new terms and expanded meanings,” said Tama Seavy, a colleague in New York, when she saw the terms “diversiphobe” and “diversiphile.” Those meanings, she intimated, may or may not be immediately apparent as accurate definitions of artifacts, situations or circumstances in a given country or culture. Consider the word “chip” and what it has come to mean compared to its definition of only 50 years ago. 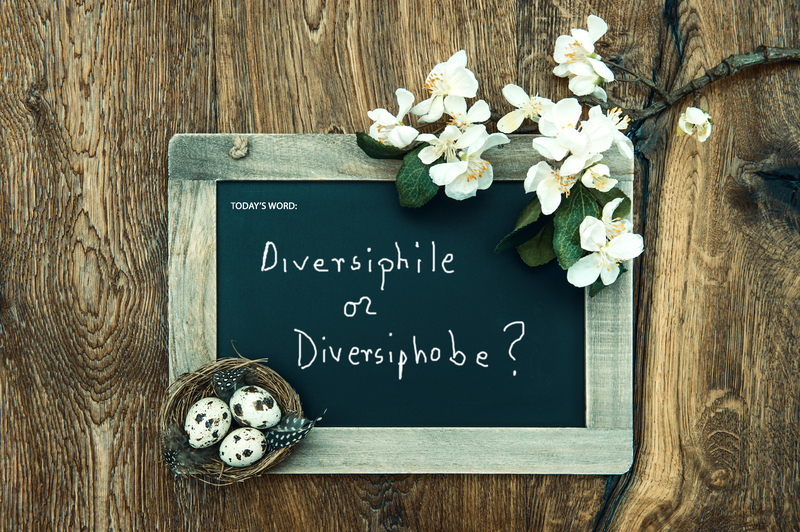 Expanding the definition and use of the fairly new terms “diversiphile” and “diversiphobe” isn’t going to be a “one and done” linguistic slam dunk. One trend we’ve seen in the general reception of the terms “diversiphile” and “diversiphobe” has been a tendency to immediately apply them to types of persons who have been conditioned to think and behave in opposing ways regarding cultures different from their own. We’ve found that both terms are quickly and overly-simplistically employed as “labels” to refer to a predominant tendency to react favorably or unfavorably toward a culture not one’s own. That was an expected reaction, but rudimentary, primitive or primal nonetheless, as we are reintroducing these rarely used terms. Thus, that imaginary line drawn down the middle of a socio-cultural struggle between “Diversiphiles” and “Diversiphobes” may well become the linguistic springboard from which to present the more flexible, meaningful, universal and “more palatable” description and understanding of a struggle, one that isn’t just black and white anymore, if it ever was. Diversiphile and Diversiphobe may prove to be a means by which we can move the discussion away from what Michael Maccoby described as a most primitive way of describing one another. It could be a start of a more effective array of ways of describing not just the characteristics about which we think, but the “thinking” itself. At the next higher level, the two terms, when juxtaposed, are seen as opposing cultural alignments in ongoing multifaceted and long term intercultural struggles/conflicts. As in the familiar political, “left” vs. “right,” characteristic agendas are carried by “activists” on each side of the aisle. It’s only the nature of the activism that ranges between violent or nonviolent, overt or covert. The concept of activism is engendered in the nature of the Diversiphile vs. Diversiphobe intercultural struggle. It is central to The Diversity Paradigm, a competition or pushing between the cultural philosophies inherent in homogeneity and heterogeneity. Diversiphiles often talk about “resistance” to diversity as if resistance was fundamentally wrong, while Diversiphobes often see “diversity initiatives” as a foray into a cultural sovereignty, accompanied by requisite push-back. The Diversity Paradigm agendas, strategies and tactics have a lineage that go back to the American Civil War. Further still, the Diversiphile and Diversiphobe mindsets may be seen as attitudes that anyone might adopt on any given day and under varied socio-cultural or secular circumstances. For example, some may enjoy aspects of one culture other than their own (cuisine, art, music, garb), but simultaneously have an aversion to other aspects of that same culture (dominant religious or political ideologies, customs/habits, social structures, etc.). Under the InclusiveWorks® rubric, the meanings of “Diversiphile” and “Diversiphobe” are elevated. b) diversiphobian contrastive responses (shifting of one’s judgments away from the norm of the observed culture) through nonadaptive or maladaptive disidentification motives. These frames for responses to cultural cues are neither static nor automatic, but are situational, affected by dynamical factors such as cultural priming, personal cultural identity, active motives, cultural influences, security needs, and more. Importantly, both diversiphobian and diversiphilian frames can and do exist and operate within individual persons, normally and noncompetitively compartmentalized. For example. examine Diversiphile and Diversiphobe frames through a social identity theory filter. Therefore, in either of those cultures, American or Indonesian, a factor like identification with nationality may vary across diverse issues and opinion, creating a varied response to national identity within the same person, who may appear to be diversiphilian on some issues, diversiphobian relative to others. This underscores that Diversiphile and Diversiphobe can be described as not merely “types of people,” but as a new and unique way of describing sets of mental topologies (frames) that can be and are instilled, taught/learned, and can therefore be recognized, understood, unlearned or neutralized with targeted training. At their extremes, both can be disruptive to learning, performance, goal attainment and even organizational continuity. Diversiphilian and diversiphobian frames represent thinking styles based in activism and advocacy, thought processes and attitudes informally and culturally instilled as parents teach children, tribes teach members, schools teach students, and nations teach citizens. That frame is a mental and psychological frame into which people shift when differences become such a priority that they take attentional precedent over common interests. In this context, the terms can certainly apply to the thought processes of any persons under varying cultural circumstances where they find themselves in conflict over differences, but also when adapting to differences. The Diversiphile and Diversiphobe training are specific methods designed to apply to each frame, individuated for the client. Never before presented in this way, they are distinct context-appropriate teaching methodologies for addressing intercultural issues brought about by a 21st Century convergence of civilizations in a global community against a backdrop of an almost universal differences-based mentality. Diversiphile® branded Training/Coaching engages the learner in a process that emphasizes acceptance of rejection, embracing the right of others to assert the superiority of their cultural beliefs and attitudes, and to avoid change-seeking merely for a specific purpose related to personal and organizational objectives. Diversiphobe branded Training/Coaching engages the learner in a process that facilitates a temporary suspension of cultural beliefs and attitudes for a specific purpose related to personal and organizational objectives. Diversiphobe and/or Diversiphile® branded Training and Coaching facilitates work and professional behaviors and attitudes centered in the achievement of cultural equanimity in challenging intercultural work environments. How would you apply the terms “Diversiphile and/or a Diversiphilian philosophy” and “a Diversiphobe and/or a Diversiphobian philosophy? How do you see that struggle or conflict between the Diversiphobe and Diversiphile taking shape within you in this 21st Century environment of growing intercultural conflict? CONTACT US for information on Diversiphile® and/or Diversiphobe branded Coaching and Training Programs, teaching professionals the secrets of managing and working effectively with the Diversiphile® and Diversiphobe frames in your business or professional career.